Centerville is a relatively light board game for 2-4 players. 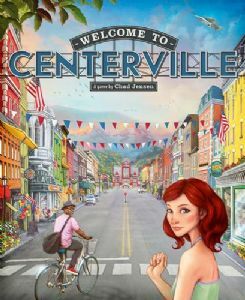 Centerville abstractly models the growth and management of a small city — perhaps not unlike the one you're in right now. Players act as entrepreneurs, tycoons, politicians, and other local movers and shakers working to develop a modern urban area. Fortunes will be made and fame will rise. As time goes by, personal milestones will enrich the players even further. Throughout the game, players will roll six dice, keeping some and rerolling others, then implementing the various die faces on the game board. This will result in political offices being gained and lost, new vocations learned, new land acquired, or new buildings constructed. The end result is a vibrant community revered near and wide — but only the player who has best balanced their wealth and prestige will emerge the final victor. Playing time is 15-20 minutes per player.